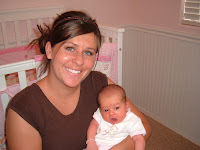 This is our oldest daughter holding her oldest daughter! Well today is the 19th and no doubt my LOVE of the day is Jesica! It is her 27th (man, are we old!) birthday. BD and I have never been the same since the day she was born. She has brought more happiness and love to our lives than we could have ever imagined! We have a tradition in our family on birthdays...and that is we go around the room and everyone tells why they love the birthday person...so, here is our tribute to Jes. Wish you were here. J is for JOY. I always tease Jesica that her middle name is Joy and I wish it was! She has been a joy to us for 27 years. She makes me feel joy when she is around and can bring joy to me with her phone calls and really great notes! E is for EVENTS. Jesica loves events! (ie. parties, holidays, vacations or just lunch) She is usually the life of the 'events'. It is always more fun when Jesica comes and we miss her so much when she is gone. S is for SHOPPING. There is no other 'S' word to describe Jesica. She loves to shop and is dang good at it. I is for INCREDIBLE. Jesica makes incredible banana bread and incredible cinnamon rolls! She has been incredibly thoughtful and understanding of me while I have been sick. C is for CREATIVE. Jesica has a knack when it comes to decorating her home, her wardrobe and in her hairstying. She has great ideas and can turn them into reality. She does some really cute and creative scrapbook pages too. A is for AWESOME. We think Jesica is awesome. She is an awesome wife...a great lover (check out her blog! )...a good homemaker...a cute mom to Savoy...and a wonderful daughter. Jesica is all these things and so much more and these are a few of the reasons we love her today and every day. Happy Birthday Jesica. What a great post! Jesica really is all those things and more. Oh Jes, she should be very happy on her birthday she has a tribute on about every blog in town. Thanks Mom and Dad I love ya!